The Graphite India #AirPollution campaign – NGT upholds KSPCB CLOSURE order from 2012! Following the Supreme Court order, where Graphite India was recognized as a polluter under the Polluter Pays Principal, the complainants continued their case in the National Green Tribunal (NGT). The hearing was on Monday, Jan 28th, 2019. 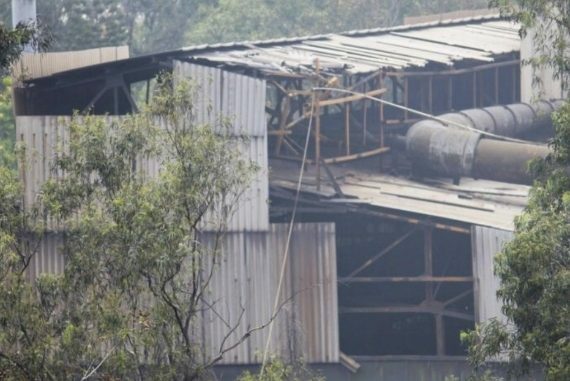 The NGT order nullifies the Consent for Operation that Graphite India received from Karnataka Pollution Control Board in Dec 2018 to re-open the factory. A big win for residents who have been raising concerns against the blatant pollution by Graphite India for a long long time! Many have worked tirelessly and persistently for the last 10+ years. Continued efforts have brought us to this point. Residents around the factory say that their concerns have been vindicated. Don’t give up, they say! Complaints against the pollution caused by Graphite India has been raised since 1997-98. Again in the early 2000’s, residents and villagers of Seetharampalya brought concerns to KSPCB without respite. As more and more residents moved in, the gravity of the situation escalated. In 2009, multiple communities and commercial establishments around the factory banded together. The black soot was coating all surfaces and more & more residents were falling ill.
KSPCB swung into action, held hearings & inspections. In 2012, KSPCB gave a Closure Order over the failure of Graphite India to even make the simplest of repairs. The missing roofs & side panels of the graphitization unit being among the prime ones. This Closure Order was contested by Graphite India at Appellate Authority, which then overturned it in 2013. For justice, the complainants approached the NGT Chennai Bench in late 2013. Many hearings and inspections were held. Graphite India continued to flout all norms and pollution mitigation measures. In 2017, the Chennai Bench of the NGT was dissolved as the three judges retired. It was then moved to the Delhi bench. In 2018, the campaign got a boost. Newer communities joined the fight. 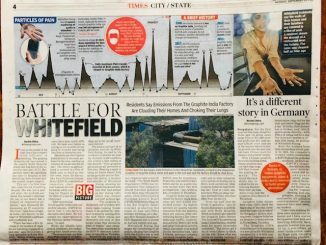 Air monitoring data from AirCare showed how dangerous the PM2.5 levels are at the Graphite India Junction in Whitefield. And the numbers were way off the charts. Whereas CPCB holds PM2.5 levels above 90 µg/m3 as hazardous for health, the readings at the Graphite India Junction were topping 250 µg/m3! At 2am in the morning!! The complainants appealed to KSPCB again, who then withheld the much required Consent for Operation every category industry has to renew annually. Following a Public Hearing in September, the KSPCB Chairman visited the factory for the first time and was astounded as the level of dilapidation and disarray! The black soot was everywhere. In October 2018, the complainants got a chance to present our case at the Supreme Court after Sunita Narain of Environmental Pollution Control Agency (EPCA) included the polluted corridor of Whitefield in the ongoing hearing in a Pet Coke case. Subsequently, Graphite India Counsel was asked to explain the air pollution accusations leveled against the company. 1. The concept of Polluter Pays is a recognizable offense across the world. Given that GI has investors spread all over, and a factory in Germany, it brings in much needed scrutiny. 2. For the first time in 20 years, GI took steps to clean up their act. At least visually – which is what we can gather from looking over the factory compound here at Whitefield. They have repaired the roof & sides of the building which housed the graphitization unit. This was one of the items GI was asked to repair since early 2000’s! The Supreme Court also advised the complainants to continue at the NGT, pending since 2017. KSPCB meanwhile was evaluating the repairs as promised by Graphite India to the Supreme Court. In December 2018 following an inspection and hearing – do note that notice of this hearing was not given to the complainants – KSPCB gave Consent for Operation certificate till June 2020. On January 28, 2019, the pending NGT case came up for hearing at Delhi. World Water Day – Let’s clean our lake!